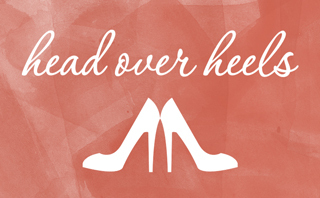 This week I took on a fashionable and oh-so-easy DIY! 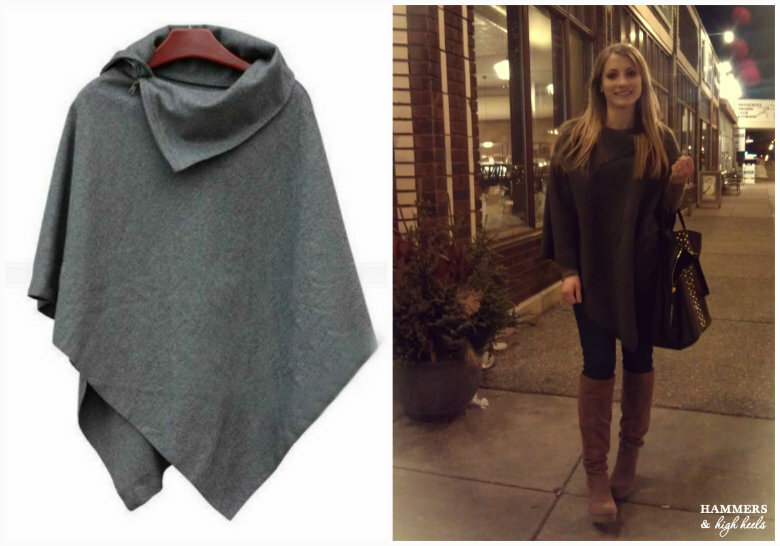 I hope you'll be Head Over Heels for this trendy vintage inspired Cape Poncho (even though I hate the word poncho)! 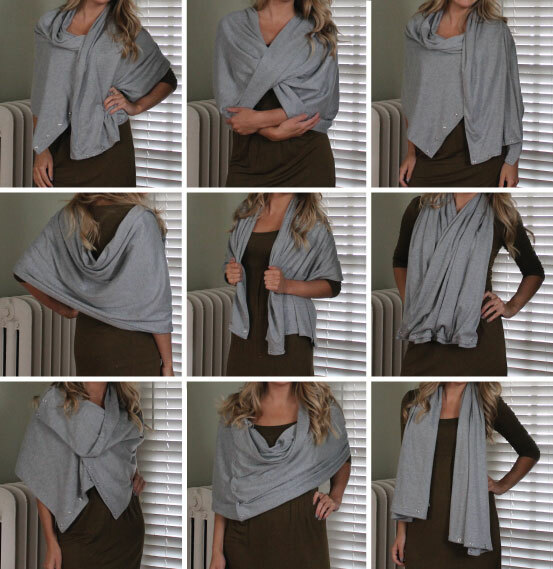 It looked so stylish and pretty versatile, almost like a cape or beautifully draped scarf. At the time I almost thought about starting to negotiate a price for it but quickly realized I could easily make one at home- and thankfully I didn't forget! All I used was 1.75 yards (roughly 60 inches) of wool blend fabric, scissors, sewing thread and a sewing machine to create the look. 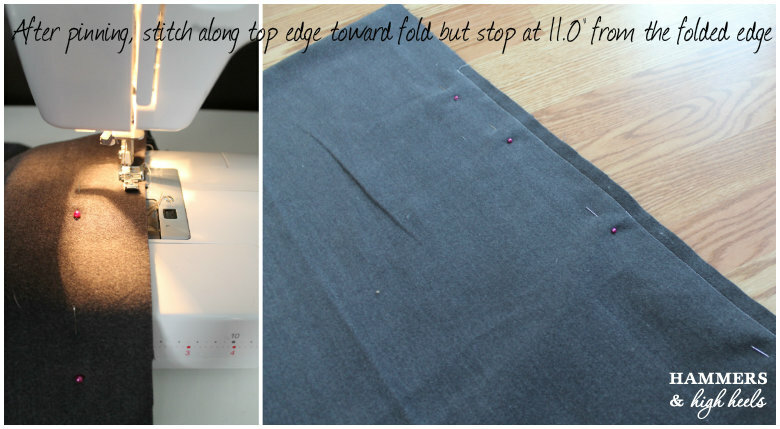 Basically all you do is fold the fabric in half, stitch 3/4 of one side, then cut part of the fold open at the top and BOOM! You're done! 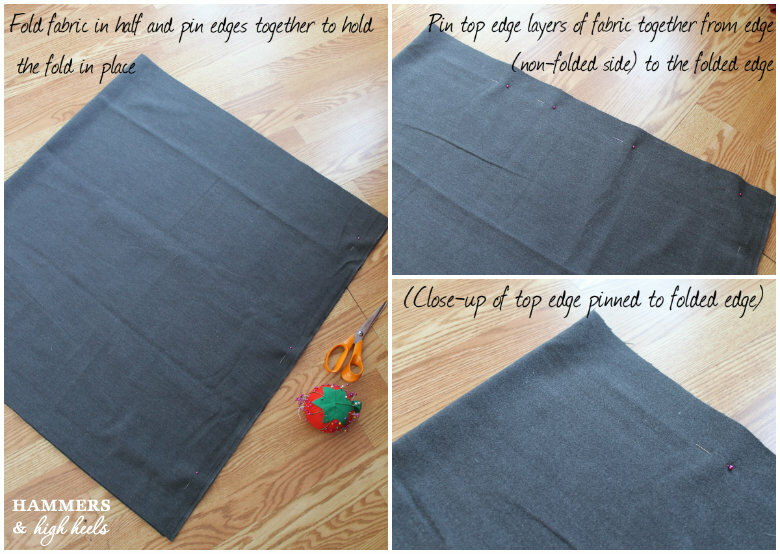 I included the tutorial below, it is so easy and even if you don't have a sewing machine you can tackle by hand (sewing is minimal). Enjoy! The end look is so casual yet chic! I had to wear it out to dinner & drinks with friends tonight (hence the late post). 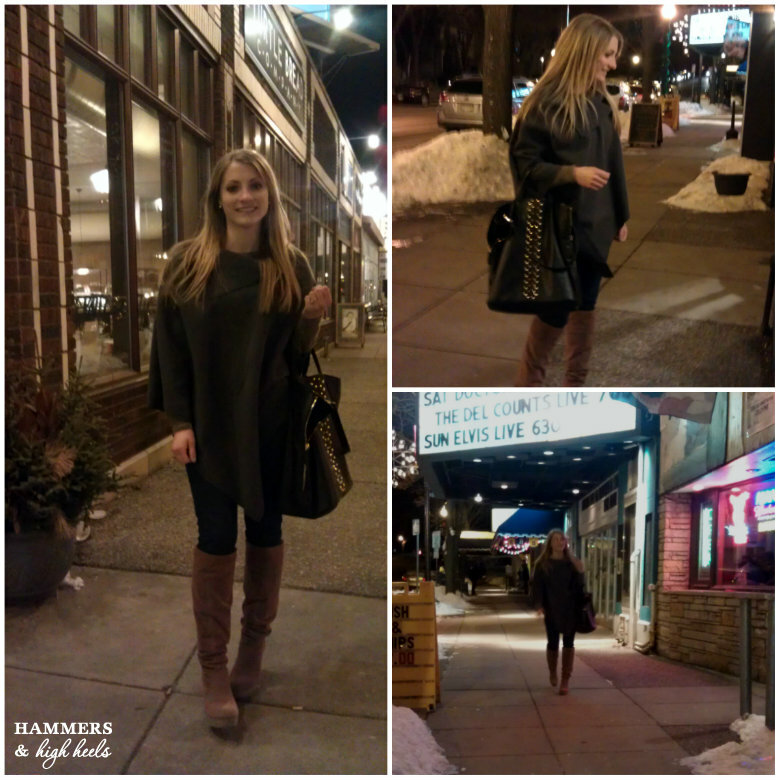 Made for a fun fashionable alternative to a giant winter coat! Sorry for the cell phone pics! But I really loved wearing it out and about tonight! No one, again NO ONE shall wear a cape/poncho type garment with any sneaker/athletic type shoe, solid colored cotton-knit turtle neck, or big baggy lazy looking pants. These items are so, so wrong for anyone of any age, size, height, etc. to wear with a cape/poncho type garment. 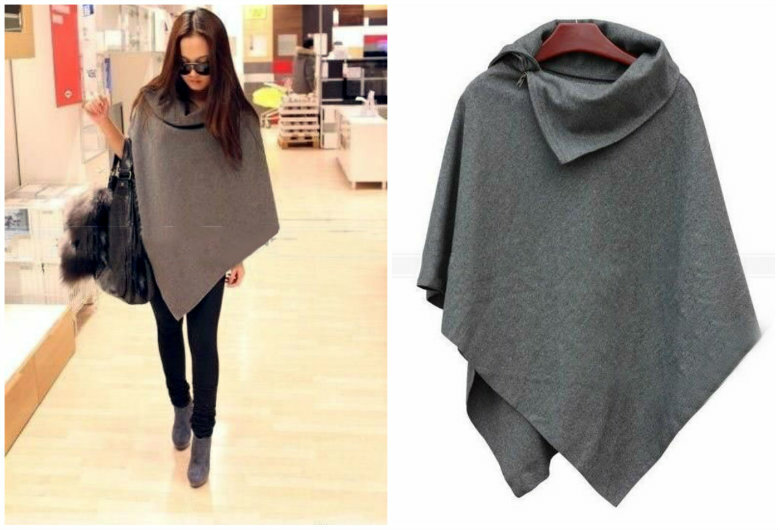 I know I love it, but are you Head Over Heels for this DIY Cape/ Poncho too (still shuttering slightly at that word)? If you want another DIY (or a harder one) here's the link to my DIY Snap Scarf too! Love it! Wish I could pull off that look:) Looks super-cute with the boots. Thanks :) I think I am going to make another version with a zip at the neck so it can be more adjustable, stay tuned! How wide was the fabric you used? Thanks for the cape tutorial. Looks comfy and easy to wear....what's better than that!! Thanks for the tutorial. Looks comfy and easy to wear.....what's better than that!! I can't wait to make this cape-but even more excited to wear it! I got some awesome new dark dusty pink/red woolish material at a garage sale today for $2.00. (60" x 2 yards) What a great deal to make such a stylish fun cape. Perfect! so if I am reading correctly, you left it unhemmed...........is that right? Yes, I did leave it unhemmed since the wool/felt like fabric allowed it, some other fabrics might require a hemmed edges so it doesn't run. I love that poncho look! This looks adorable. I have a cape pattern, which I have made three different versions of. This looks much easier to make and looks just as good if not better. Will be looking for the ideal fabric and will be making your version soon. No where in my small town sells fabric, so will have to travel elsewhere, or maybe look on ebay. Thanks for your post. I love to hear from you! What's on your mind?